The bluetooth digital key allows users to do just about everything a traditional key can do, just from their smartphone. Smartphones can do just about anything: open your hotel room door, or unlock your front door. Starting next year, the device will do even more if you’re in the market for a Volvo. The carmaker announced Friday that it would forego traditional car keys in favor of digital keys that live inside an owner’s smartphone via a dedicated app. Volvo, which is billing itself as the world’s first car manufacturer to offer vehicles without keys, says that digital keys will allow users to do everything a regular key can do: unlock/lock the doors, opening the trunk, and starting the engine. Customers who don’t want to deal with a digital version of their key can opt for a traditional key. “The innovative Bluetooth-enabled digital key technology will offer Volvo customers far more flexibility, enabling them to benefit from entirely new ways to use and share cars,” the company says. Digital key users will be able to receive more than one key on their app, Volvo says, allowing them to access different Volvo cars in different locations. For example, the company says people could potentially book and pay for a rental car anywhere and have the digital key delivered to their phone immediately. It’s unclear if the app includes security features to prevent someone from using the digital key if a phone is lost or stolen. The new technology is also a key factor in Volvo’s other new venture; a car sharing service called Sunfleet. The service will pilot digital keys this spring in Sweden. 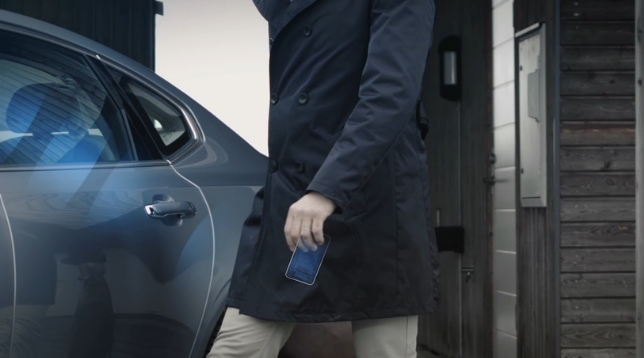 “Volvo Cars’ digital key means that sharing a car will become both simple and convenient. Volvo owners will be able to send their digital key to other people via their mobile phones so that they can also use the car, this may be family members, friends or co-workers in a company,” Volvo says.